The throne in the Palace of Heavenly Purity 乾清宫 (Qiánqīng Gōng) sits behind a desk on which the emperor reviewed papers and documents. 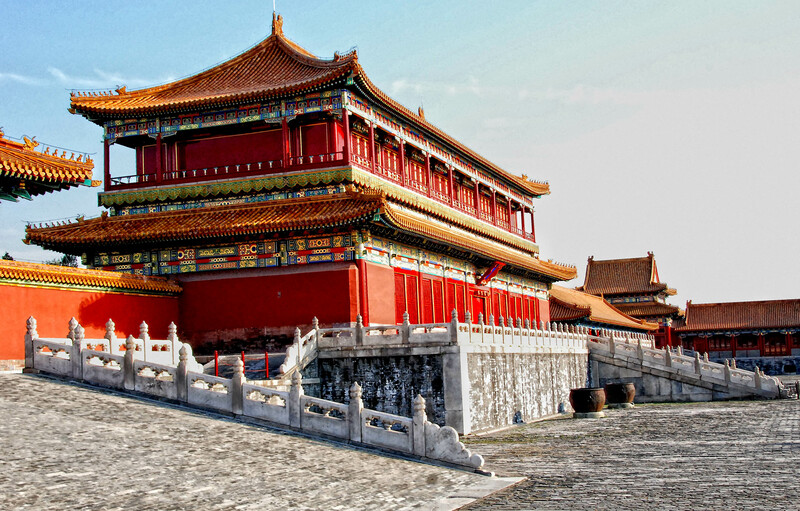 Under the Qing emperors, beginning with the Yongzheng Emperor 雍正 (Yōngzhèng, 1678–1735), the palace was used for audiences and meetings. The plaque above the throne was written by the Shunzhi Emperor 順治 (Shùnzhì, 1638–1661). It reads, “Be open and above-board,” (正大光明, Zhèng Dà Guāng Míng). The inscription seems to have appealed to the Kangxi Emperor 康熙 (Kāngxī, 1654–1722) who used it to solve a problem. Kangxi had 22 kids and 14 surviving sons which wouldn’t be a problem except that only one could succeed him. He chose his eldest surviving son, Yinreng 胤礽 (Yìnréng, 1674–1725), as his successor. That should have been the end of it. The rest of the boys could be given jobs and go off and live their lives. Two factors made that problematic. Under the Chinese system of succession, being born first did not guarantee the throne, the emperor chose his successor. The second factor was that Kangxi had the longest reign in history; 61 years. If you are the crown prince, what do you do while you are waiting for the old man to die? You have all the wealth that one could imagine, great potential, everyone seeks to curry your favor, and you have nothing to do. You’re not going to go out and start a career, you’ve got one. So Yinreng played. He got into lots of trouble. The situation was so bad that he was an on again, off again Crown Prince. His father would demote him and then promote him again. Finally, Kangxi had had enough. All of his sons were jockeying for the position. He declared that he wasn’t going to tell anyone his choice. He would write the name of his choice in his will and place the will in a locked box behind the plaque. In due course, the Kangxi Emperor died and a chief minister opened the box and announced that the fourth prince, Yinzhen 胤禛 (Yìnzhēn), had been chosen. Sounds simple? It wasn’t. Everyone had expected the fourteenth prince to be named and accused Yinzhen of forging the will. Yinzhen was the quiet one. They couldn’t imagine that Kangxi had chosen him. When Yinzhen became the Yongzheng Emperor 雍正 (Yōngzhèng, 1678–1735) he refined the system to prevent such accusations. He, like his father, put the name of his successor behind the plaque, but he also always carried a copy on his person. After that, it became tradition.